In about six months, our little family will take off on a new adventure. We’ll leave this home that we’ve built and lived in for the past five years. We’ll pack our beloved belongings in boxes and take down the pictures from the wall. We’ll scrub the baseboards until they sparkle and we’ll finally get those pesky blueberries out from underneath the fridge. Soon, a new family will live here. We’ve been talking to the farmer down the road about making the move, and he’s interested. He has a little girl about the age of mine, so we’re leaving the polka dot stickers I affixed to the upstairs bedroom wall. They’ll cook on my favorite old oven and use the farmhouse sink that my husband’s great-grandfather once installed in his homeplace. It’s difficult, this transition from home to house. It’s delicate, this removal of everything we’ve known and loved. It’s even more bittersweet because it took us so long to get here. My husband and I rented this little brick cottage on the side of the road when we were just newlyweds. The first night we moved in, I walked out of the back door in my bare feet. I looked out at the wide backyard, full of acres of pecan trees, blueberry bushes, muscadines and wild blackberry vines. 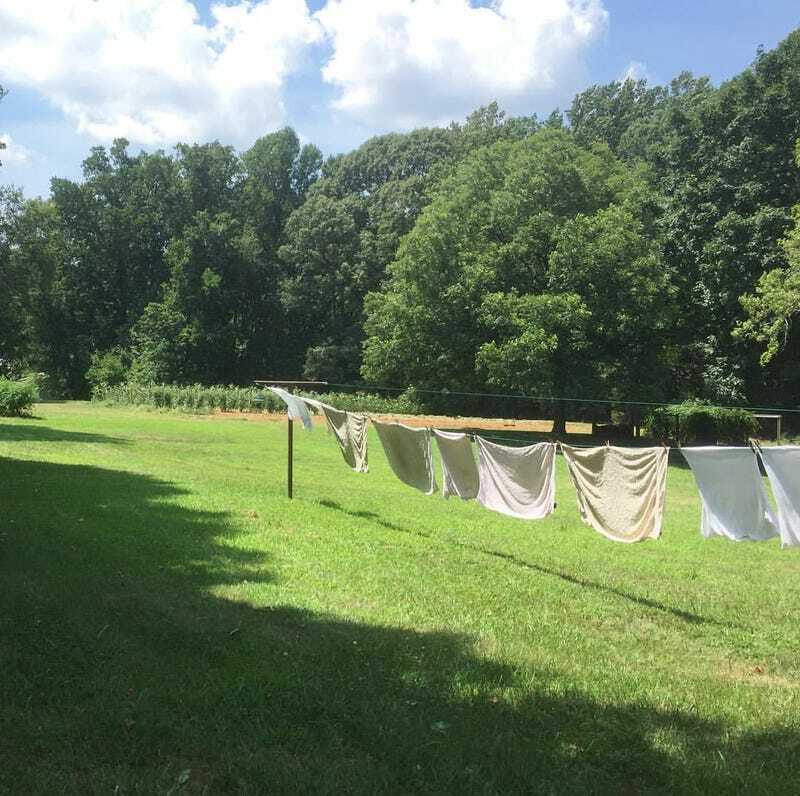 I saw the old clothesline and pictured myself hanging baby clothes there one day. I stood there, beneath the towering oaks that outline the back of the house, and I cried silent tears of gratitude and joy. We rented the home for three years and decorated it to the hilt with kitschy vintage wares sourced from the thrift store because that’s all we could afford. We’d come home from work and try out new recipes. I got really into vintage clothing and my husband started to home brew. We grew a tiny garden every summer and always had a big enough bounty to share. It was a sweet way to start this new stage in our lives, and I’ll always look back on those green years with nostalgia and joy. Then, we thought something better was out there. We decided to build, and moved into a nearby family home to live for free while we squirreled away our savings. Once we’d amassed enough, we decided to take the plunge and start breaking ground. Then, one day I was driving home from work and I passed our little cottage. It was overgrown, with a ton of junk and mismatched furniture on the side porch. The shrubs were almost overtaking the windows and my beloved clothesline was snapped in half. That was my sign. I called my husband immediately and we suddenly had a new change of plans. We talked to our neighbor about buying the home. We worked with a mortgage lender to figure out the finances and we hired a lawyer to help us iron out the legal process of homebuying. In about a month’s time, the home was turned over to us. I’ll never forget walking back through those doors the second time around. I didn’t go out back and cry, as I’d done in the beginning. This time, there were spiders everywhere, the home had a strange odor everywhere, and there was a thick layer of dust and debris everywhere. My heart sank and I wondered what we’d gotten into. Yet, piece by piece and day by day, we worked to restore our little homeplace. We tore down walls to make the spaces bigger. We removed decades-old sheetrock and installed all new wiring. We painted every surface a bright and sunny color and we removed antiquated paneling. It took about two years, but the night we moved ourselves and our two children in, I knew we were home. Now? In a short amount of time, we’re moving once again. This time, we’re going just two miles down the road. We’ll move everything into a family home that sits far off the street. It’s got cornfields and a big wooded backyard and a deep ravine and plenty of space to run and play. It’s our forever home, and we can’t wait to get our hands on it and start making it ours. Yet, I can’t help but look back at our time in this little cottage and be thankful for the years it gave me. These were my young mom years. They were my hamburger helper on Thursday night years, and my stay up all night to finish my writing years. They taught me to make much from little and appreciate the smallest moments with the smallest people. I’m not sure I’ll ever drive by this house without looking for my four-year-old daughter on the side porch, library book in one hand and popsicle in the other. But life marches on and so do we, and I look forward to seeing where this journey takes us.